MERRIMACK – Merrimack High School athletic director Mike Soucy is walking around during early spring season tryouts with a big grin. Why? Because he feels his baseball and softball programs are in great, not just good, hands. 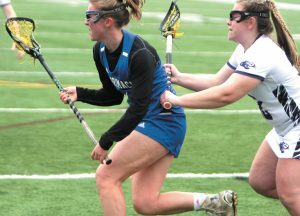 It was a tough off-season for both sports after a tough 2018 spring in which both teams missed their respective Division I tournaments. Soucy opted to make a change in softball, hiring former St. Thomas coach Greg Cochrane. He may have left baseball untouched but philosophical differences led to Kyle Harvell (now an assistant at Pinkerton) stepping away after just one season. But then Soucy found former Merrimack assistant Kevin Moyer among a big pool of candidates. And he’s thrilled. It’s always difficult for programs to have three coaches in three years, which was the case for both. Moyer had spent some time on the staff under former Tomahawks coach Nick Jaskolka. He played his high school ball in Georgetown, Mass., but played his college ball right here at Rivier University where he got entrenched in the area. He left MHS after the 2015 season to be on the staff at his alma mater. He had worked in the Merrimack system for the better part of seven years, and while doing so was also coaching under former ‘Hawks mentors Ryan Anderson and Jim Davala. But a couple of years ago he moved back up to the area – he teaches in the Windham school system – and jumped at the chance to return to Merrimack. As soon as Moyer was hired, he met with his prospective players, reached out to the seniors to make everyone more comfortable. “We talked about things that had happened in the past,” Moyer said. “Different coaching philosophies, what my coaching philosophy was. Just kind of letting them know that my plan is to be here a long, long time. And that my coaching philosophy was going to be different from some of the previous coaches. Moyer is learning the difference between being a head coach vs. an assistant. He moved back to the area two years ago and was looking for the right head coaching job. “When Merrimack opened, I was licking my chops,” Moyer said. Moyer is happy with the fact the Tomahawks return a deep pitching staff and the entire starting infield. And a lot of these players he knew from his time teaching in the system when they were younger. Meanwhile, Soucy is glad Cochrane is here, period, because he was afraid he might not be available. “I was a little worried, we dragged this out a little longer,” Soucy said. “We had 15 applications for baseball so we focused on that first and put softball aside for awhile. I was afraid we were going to end up losing him in the end. Cochrane said he kept in constant touch with Soucy and preferred Merrimack to some other jobs that were open. Cochrane had success in four years at St. Thomas, four tourney teams and a 13-4 team a year ago that had injury woes and lost in the quarterfinals. He also coached in Massachusetts at Saugus High School as an assistant. Cochrane found a group willing to accept change when he took over. Cochrane wants effort, and wants to see how his team might respond to adversity. Maybe it’s pre-season optimism, but there’s no denying the fact that right now, the Merrimack baseball and softball programs are singing the praises of their new coaches.